It’s Hangover Thursday, how’s your head? I have a massive allergy headache so I’m glad that I took it easy at the bar last night. I had a Shipyard Blue Fin Stout and then a bottle of the fantastic Yeti Imperial Stout. I really enjoyed the Yeti and will probably talk about it more in depth at some point in the future. 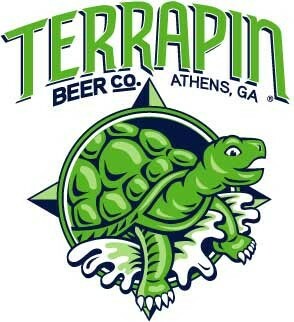 Today I’m talking about something I tried on Sunday though, Terrapin Reunion Ale 2011. I know that seems like a strange name, but there is a reason for it. 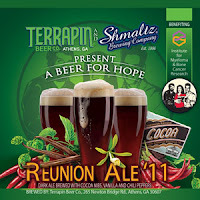 Three years ago Terrapin started a tradition of collaborating with other brewers to make a limited run of Reunion. Each year is different beer from the one before it. This year they teamed with Shmaltz Brewing to create a dark ale that tastes like nothing I have ever had before. It starts off with a sweet vanilla taste and leaves your mouth tingling. As you continue to drink it, that tingle becomes a burn. By the time you’ve finished your glass; your belly feels like you just at 12 hot wings. Yup, Reunion Ale 11 is made with vanilla, cocoa nubs, and chili peppers. Sales of Reunion 11 also benefit the Institute for Myeloma and Bone Cancer Research. The beer is actually Terrapin’s tribute to Virginia Maclean, who passed away from Multiple Myeloma in 2007. It’s a great beer and a great cause, I encourage you to pick up a six pack if you find it in your favorite beer store.